If you want a copy of the latest issue of IJIS, become a member of International Society of Ikebana Studies. 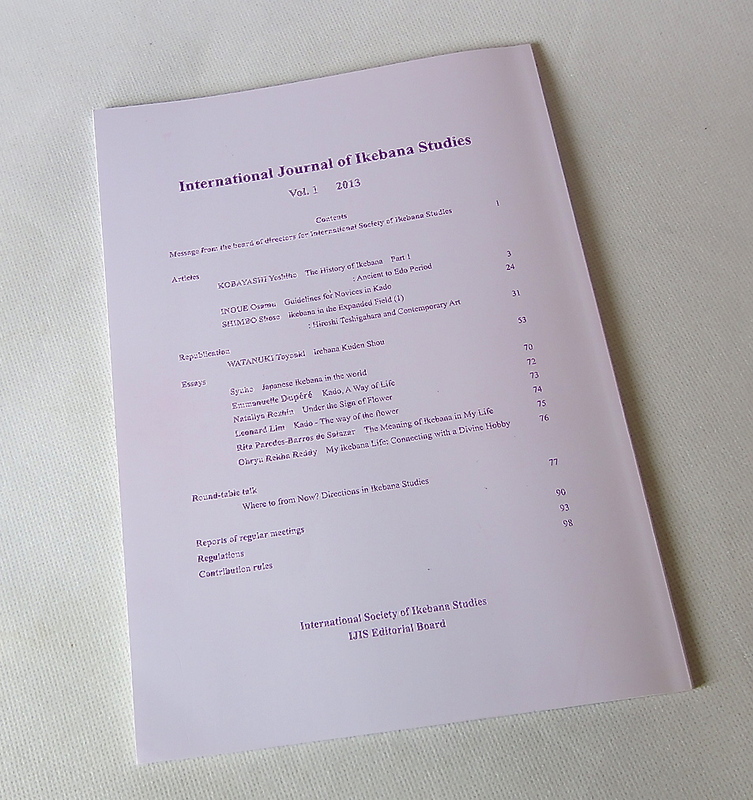 If you want multiple copies or previous issues of IJIS, please send an email to isis.ikebana@gmail.com. The International Society of Ikebana Studies (ISIS) is pleased to announce the call for submissions to the publication of peer-reviewed International Journal of Ikebana Studies (IJIS). ISIS accepts papers only from its members. Please join ISIS first to submit your paper. ISIS may accept an Ikebana essay (up to 600 words) from non-members once per person. Double space (instead of indent) to designate a new paragraph or section. Page numbers at the bottom center of each page. Top, bottom, and side margins no less than 7/8 of an inch or 2.2 cm. Cover page that includes title, authors, their affiliations, their contact information, and the topic of the submission. Title, authors and affiliations repeated at the beginning of the body of the paper. Manuscript should be approximately 2,000-5,000 words in length and should not exceed 5000 words (excluding tables, figures and references). Paper submissions must contain no more than 30% of textual material published in other places by the same author or authors, and these other places must be acknowledged and cited. Graphs and visuals can be reproduced electronically. Papers must have a minimum of five scholarly references. Publication and Licensing Issues: Authors retain copyright in their work but are agreeing to a Creative Commons Attribution 3.0 License for their work to help ensure continued global access to the work over time. All publications will be openly archived eventually.